With greenwashing a major industry issue, the number of certifications and labelling claims around natural and organic & personal care was under the spotlight at a recent industry event. The Ecovia Intelligence event, Natural Cosmetics Masterclass: Future Direction of Ethical Labels, took place in London last month. It considered the array of labelling claims and certifications currently available on the European market for natural & organic products and ethical practices, and discussed how brands can act responsibly and set their product offerings apart in this area. 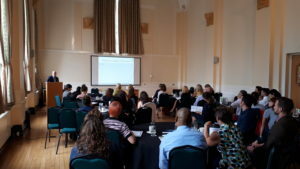 The day was convened by Judi Beerling, who heads up the technical research division at Ecovia Intelligence, providing research and advice on formulation and technical issues concerning natural and organic cosmetic products. Expert speakers included the Soil Association’s Emma Dawes, Neal’s Yard Remedies’ Head of Sustainability, Louise Green, microbiome-related skin care player Gallinée’s founder, Marie Drago, and ICADA and the ISO Standards Committee’s Reinhold A Brunke. Amarjit Sahota, founder and president of Ecovia Intelligence, opened the day with an overview of the market for natural & organic cosmetics in the UK market, noting that trends within the UK are much slower when it comes to this category than elsewhere in Europe (countries like France and Germany have much more sophisticated consumer demand and product offerings). For example, in Germany, the per capita spend on naturals and organics is 15 EUR per year, while in the UK it is just 5.2 EUR. According to Sahota, Ecovia Intelligence research suggests that there are four key drivers for consumer spending on the natural and organics category. These are: concerns about synthetic chemicals, ethical considerations, increasing distribution of these products, and media reports. The key element within these four is the fact that natural and organic products are simply more readily available: there was a 77% growth in the sales channels retailing these products over the past eight years. Growing demand and purchasing of naturals and organics is evident in beauty and personal care, so what are the trends to be tapping into? Sahota suggests brands should focus on distribution (mainstreaming and concept stores); ingredients (clean trend, novel ingredients and ethical ingredients); and products themselves (increased segmentation, green packaging). looking to certify their products as organic, the more strict of the two labelling claims available, suggesting a genuine will from brands to avoid greenwashing in this area. Brunke, meanwhile, gave a presentation on the recently announced naturals ISO standard, which, he suggests, could mean we can do away with individual certification marks and claims. Nevertheless, it seems consumer demand for labels they can research online and marks visible on packaging remains high, and it’s down to individual brands to make sure they are rigorous in meeting these demands in a meaningful way. Further updates on the natural & organic cosmetics market will be given at the Sustainable Cosmetics Summit. The European edition will be hosted in Paris on 5-7th November, whilst the Asia-Pacific edition will take place in Hong Kong on 12-13th November.